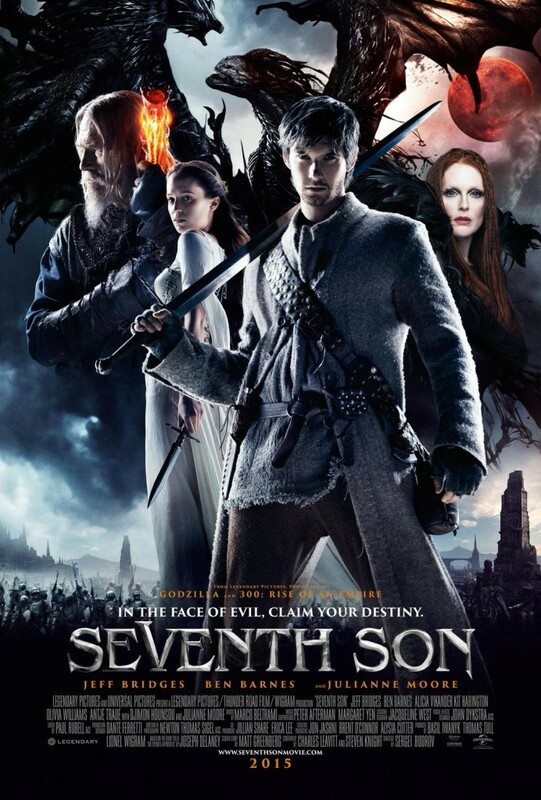 Seventh Son is slightly more enjoyable than the usual schlock that moviegoers are often treated to when they go to see period action or epic fantasy in theaters in January or February of any given year. It avoids camp, tries its best to incorporate a good bit of its source material (while also taking extensive liberties), and features a solid, affable performance from Ben Barnes, the young actor playing the film’s titular character. But what ultimately dooms the film to being added to the fantasy film crap heap that usually gets so many new additions at this time of year, along with what look like cut-rate visual effects and pedestrian action and stunt work, are the performances turned in by the film’s A-listers. Jeff Bridges and Julianne Moore both look and sound so completely out of place that their turns are more likely to set off unintended laughter among audiences than any other sort of intended response. Based on The Last Apprentice: Revenge of the Witch (The Spook’s Apprentice in the UK), which served as Book 1 in author Joseph Delaney’s much-loved “Spook Series”, the film focuses on the efforts of John Gregory (Bridges), whose long service as a “spook” (a traveling witch hunter/exorcist/monster slayer) has far fewer days ahead of it than it does days behind. Gregory faces with the challenge of finding a new apprentice to help him deal with an old and very personal enemy, Mother Malkin (Moore), a powerful witch who has escaped the prison Gregory locked her away in decades before and whose powers increase with the rise of a Blood Moon. But a Spook’s Apprentice can’t be just anyone. It must be a seventh son of a seventh son, gifted by the incidence of their birth with the ability to see things others can’t, things that go bump in the night like ghosts, ghasts, boogarts, and the like. 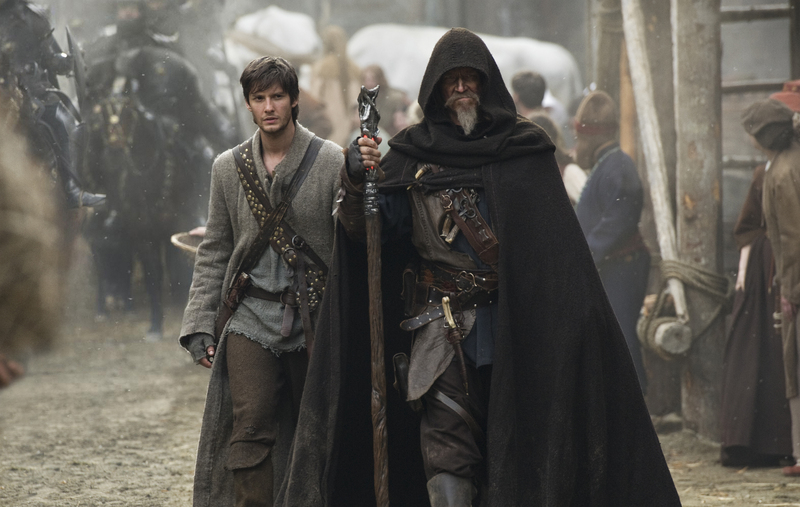 Gregory himself, of course, was the seventh son of a seventh son, and his need to train a new ally brings him to another, young Thomas Ward (Barnes), who is only too eager to leave behind his life of farming and tending to his family’s pigs in order to see the world and find his true calling. It’s not long, though, before poor Tom begins to wish he was a sixth son, as Gregory is a tireless and tiresome taskmaster, one who seemingly expects him to learn all that he needs to know, all that his previous apprentice, Billy Bradley (Kit Harrington), learned in ten years’ time, in less than a week. It doesn’t help matters that Tom is a kind, easy-going sort, someone to whom killing even things of evil does not come easy, and Gregory seems just as interested in drinking himself into a stupor as he does in battling denizens of the darkness. Difficult working relationship or not, Gregory and Tom prepare themselves to battle Mother Malkin and her followers, each of whom is a witch or warlock with formidable shapeshifting powers. On his own, Tom must also decide what to do about Alice (Alicia Vikander), a young woman he meets shortly after his recruitment with whom he shares an immediate and powerful attraction, but who may or may not be a witch herself. What’s a boy to do when saving the world from an evil witch might mean having to kill your new girlfriend, too? Decisions, decisions! Russian film director Sergei Bodrov keeps things moving at a brisk pace and provides lots of fight scenes and one-liners for Bridges to deliver in an effort to keep things interesting, but Bridges is almost this production’s worst enemy, as he insists on delivering his lines in a muffled growl that takes more effort to simply understand than it really should. It’s a performance that sure looks like he was having a ball delivering at the time, just like the one he gave us a few years back in R.I.P.D., where incidentally he was also sporting the same crazy Musketeer beard he wears throughout the proceedings here. The appeal of the performance here is about the same as it was in that other much-maligned film: at best, forgettable. Moore, on the other hand, doesn’t vamp it up nearly as much as she should, playing the villainous Mother Malkin. She might have been well served to take a peek at some of the witchy work delivered in recent years by Famke Janssen, who seems to thrive and revel in playing these types of characters when she hasn’t been trapped working in the Taken films. But Moore tries to keep Malkin just a few steps short of pure evil, a woman scorned and betrayed time and again by those whom she loves, and thus driven to the evils she commits, and the take just isn’t compelling. This sort of story calls for a more unrestrained and overtly sensual performance, and Moore, as supremely talented as she is, simply misses the mark here. Which leaves the film to be carried by its younger cast members and its visual effects. As mentioned earlier, Barnes isn’t terrible here, but he and Alicia Vikander don’t have all that much chemistry with one another on-screen, and thus their scenes together feel obligatory and forced. Add to that the fact that the film’s last hour is predictable pretty much down to the plot beat, and the eye candy provided to bring the witches’ magical power to life look just a step above made-for-TV, and you’ve got something that might serve as a pretty good cure for insomnia once it finds its way to late-night airings on cable. The irony is that had the production chosen to stick more closely to the story as it’s told in Delaney’s novel, it might not have been nearly as predictable and pedestrian. So yes, feel free to add Seventh Son to that pile of messy, mediocre-or-worse genre flicks that includes such dumpster fires as The Legend of Hercules, Hansel & Gretel: Witch Hunters (which at least had Famke Janssen in it), Season of the Witch, and the mother of them all, In the Name of the King, Dungeon Siege 2. Don’t remember those movies at all, you say? Yup. There’s a reason for that. Starring Jeff Bridges, Ben Barnes, Alicia Vikander, Kit Harington, Olivia Williams, Antje Traue with Djimon Hounsou and Julianne Moore. Directed by Sergei Bodrov. Rated PG-13 for intense fantasy violence and action throughout, frightening images and brief strong language.